Las Vegas, NV - Three year old fillies took to the track Monday May 27 and went 1 1/16 miles on Belmont Park's inner turf track in the Grade 2 Sands Point Stakes. Second choice on the morning line Discreet Marq emerged victorious in her first start for trainer Christophe Clement in gate-to-wire fashion. Wave Theory, who had a rail trip, shook free late to capture second, three-quarters of a length behind Discreet Marq, while favorite Watsdachances got third by 1 1/4 lengths over Kitten's Dream in fourth. Caroline Thomas and Unbelievable Dream rounded out the order of finish. Fusaichiswonderful was entered for the main track only and did not start. Unplaced Horses Listed In Order Of Finish. Make your Greyhound Racing & Horse Racing wagers count even more! 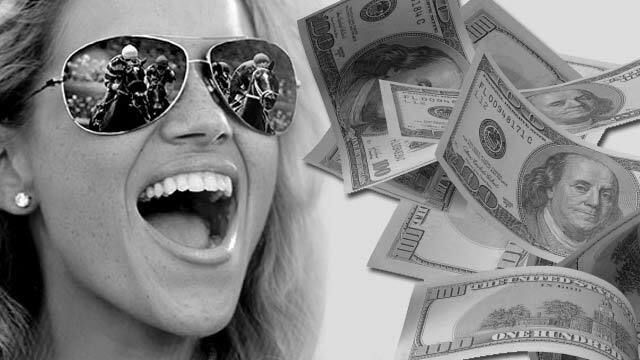 Earn daily OTB Cash Rewards at many Thoroughbred, Harness and Greyhound racetracks. Get free horse racing picks & handicapping analysis for Saturday races at Aqueduct in New York. Graded stakes horse racing results & video race replays. Watching race replays is an invaluable handicapping tool for horse betting. Zulu Alpha headlines field of 10 for Saturday's 34th running of the $250,000 Dixiana Elkhorn (G2) going 1-1/2 miles on the turf. Blue Prize headlines a field of nine in the 25th running of the $100,000 Doubledogdare Stakes (G3) Friday, April 19th, 2019. The Grade 2 $1,000,000 Charles Town Classic will take place on Saturday, April 20, 2019 at Hollywood Casino at Charles Town Races. The Lexington Stakes, the final points race in Kentucky for the $3 million Kentucky Derby runs at Keeneland on Saturday, April 13 at Keeneland. My Miss Lilly, the 4-year-old daughter of Tapit, tops the field for the $200,000 Top Flight Invitational Handicap on Saturday, April 13 at Aqueduct. The $1 Million Blue Grass Stakes (G2), offering 100 Kentucky Derby points to the winner, takes place on Saturday, April 6 at Keeneland Racetrack.